Tammi Jonas is both the farmer and butcher, but she wants you to eat less meat. She also wants you to eat better meat. The creative director of the second annual Slow Meat Symposium, being held in and around Daylesford on the 23rd to 25th of this month, Tammi is part of a team of chefs, farmers, butchers and educators who want to change the way we consume animals. Slow Meat Australia is a collaboration between Slow Food Central Victoria and the Australian Food Sovereignty Alliance. It aims to educate the public and industry about the ecological and social cost associated with intensively produced meat and highlight the regenerative and ethical alternatives. Over time, advocates for Slow Meat want to see an industry move towards the highest welfare, pastured farming systems that nourish land, animals and people. The symposium kicks off where all meat starts. Animals on a farm. Sunday, 23 September sees participants jump on a bus and head out to Glenlyon to see a farm on the ridge where ducks graze on lush pastures. This is Vue du Vulcan where farmer Fiona Briers raises her flocks of ducks. The bus trundles across to Blampied for lunch at Captains Creek organic winery, a beautiful setting for a magnificent spread of local produce. After that, it’s up the hill to see Nat and Jono at Brooklands Free Range Farm (see page 16) to see their herd of British White cattle and Berkshire pigs. A big dinner is planned at a venue to be confirmed. Monday 24th September is the big day of talks at the Daylesford Town Hall. Guest speakers will include Laura Dalrymple from Feather and Bone in Sydney, perhaps the nation’s best ethical butcher. She will be joined by Michael Hicks, a farmer with a 140ha free-range pig farm and meat brand, Extraordinary Pork, at Eumungerie, near Dubbo, in central west NSW. Also speaking that day will be author and SBS presenter Matthew Evans. Lunch is set to be a blockbuster with four chefs coming together each presenting a course using meat and other produce from local farmers. Alla Wolf-Tasker OEM, Lakehouse, will be cooking Milking Yard chickens. Caliopi Buck from Frank and Connie’s Kitchen will be cooking lamb from Ray- Monde Deux, while Kathryn Russack from Colenso in Kyneton is working with beef from Jonai Farms. Adele Stevens, from one of the regions best caterers, Dele, is working on a dish using pork from Will Bennett and Emma Horsburgh at Pig & Earth Farm. The day will be emceed by LOST Editor-at-Large, Richard Cornish. 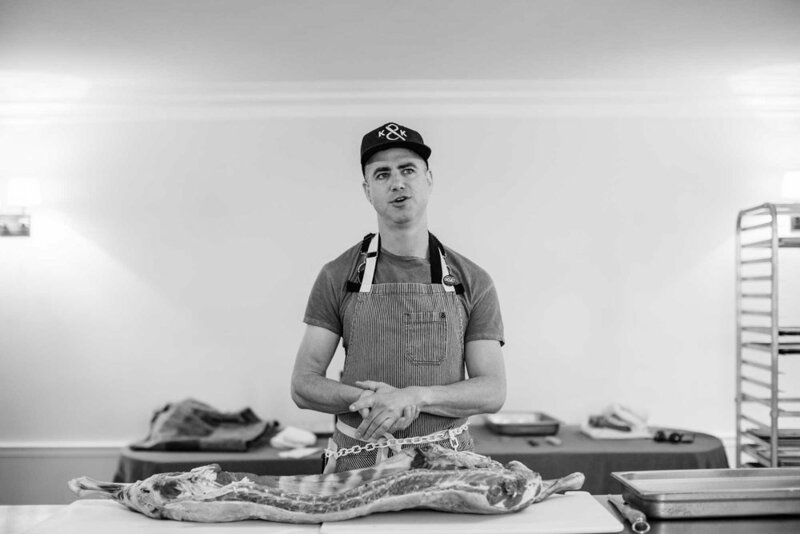 In the class, he will break down a whole carcass and describe each muscle separately describing its function, flavour, tenderness, and potential for incredible food memories. Lunch for the day will be prepared by young chef Morris Willcocks of Paddock to Pie.